This illustration explains the Sunyaev-Zel'dovich Effect (SZE), through which galaxy clusters imprint a distinctive signature on the Cosmic Microwave Background (CMB). As the CMB photons travel throughout the Universe, they interact with the matter that they encounter. When they cross a galaxy cluster, the photons scatter off the free electrons present in the hot gas that fills the cluster: the collisions between electrons and photons redistribute the energy of photons in a very characteristic way, enabling astronomers to infer the presence of an intervening cluster in the CMB signal. Since the hot electrons in the cluster are much more energetic than the CMB photons, interactions between the two species typically result in the photons being scattered to higher energies. As a result of the SZE, the CMB, when observed along the line of sight of a galaxy cluster, appears fainter at low frequencies and brighter at high frequencies, with the transition value corresponding to 217 GHz. The illustration displays two sets of frames of the microwave sky, observed in the direction of a galaxy cluster, in five frequencies each: 100, 143, 217, 353 and 545 GHz, respectively. The upper set of frames shows how the raw data appear: the signal due to the galaxy cluster is barely visible as it is buried below the dominant signals, due to the CMB and to the emission from our Galaxy. The lower set of frames, instead, show the data after careful removal of the dominant signals, which is possible thanks to Planck's extended frequency coverage and enables astronomers to extract the SZE signal and thus to identify the galaxy cluster that produced it. The distinctive signature of the galaxy cluster is clearly visible in the lower set of frames. The two left-most frames, corresponding to frequencies lower than 217 GHz, exhibit a negative signal (shown here in blue), meaning that the the CMB, observed in the direction of the cluster, appears colder than the average CMB signal, whereas in the two right-most ones, corresponding to frequencies higher than 217 GHz, the CMB, in the direction of the cluster, appears hotter than average, hence exhibiting a positive signal (shown here in red). The absence of any SZE signal in the central frame, corresponding to the null-point frequency of 217 GHz, is a characteristic of this effect. Planck's channels probe the electromagnetic spectrum both below and above this transition frequency, with one of them centred exactly on 217 GHz, thus making Planck an excellent hunter for galaxy clusters and super-clusters of galaxies, the largest structures in the Universe, through the SZE. 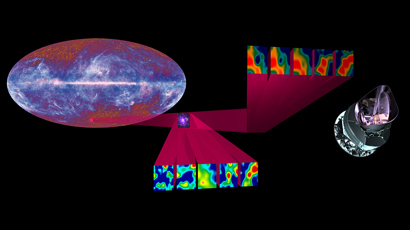 In the background of the illustration, the all-sky image from Planck's first survey is shown, highlighting the two major emission sources in the microwave sky: the cosmic background and the Milky Way.